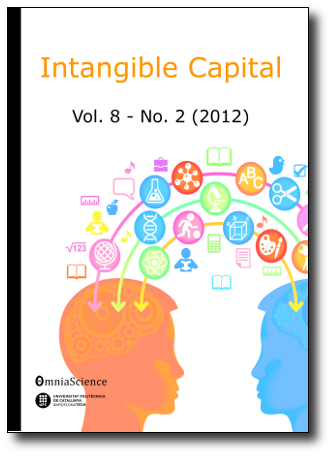 In early May it will be eight years since we editing Intangible Capital as an open access journal. We cannot hide our satisfaction for being pioneers in editing open access journals. The result of the efforts made by everyone (editors, reviewers and authors) make us proud. Effort that has allowed us to grow, but without losing the initial values, and specific goals that have marked the journal's editorial line, which distinguish it from other journals in the same area. Among them, we highlight our special orientation toward and attention to new writers and their first investigations or theoretical developments. Within this growth, we are proud of announce, as we anticipated this year, our partnership with OmniaScience, which will contribute significantly to improving the quality of the journal. This collaboration enables publishers to focus only on scientific aspects, thus gaining a greater ability to cope with the increasing number of manuscripts received. We are not exempt from the effects of drastic budget cuts in research in our country, widely criticized by the international scientific community. And the journal funding was not an easy issue since its inception. Our effort has focused on maintaining the journal open access under any circumstances, and to achieve the desired income in creative ways. However, for many years we have failed in that creativity, falling editorial costs in publishers’ own pockets. Given the difficulty of finding private or public funding, most open access journals are opting to follow the author payment system. Obviously it is not the system we like most because it can be considered unfair, since does not take into account the economic situation of each country and researcher. This type of model is most widespread in areas of medicine, where the fees passed to authors are quite high. It is worth mentioning, though, that the vast majority of researchers of these areas have significant public or private resources to fund their research. In this case, the resources of the author payment do not come from the authors' own pockets, but from the public and private financing institutions. In this case, the author payment is grounded on the institutions that provide researchers funding and legitimacy. But we do not forget that there is another side of the coin. We realize that not all researchers have adequate financial resources to conduct and publish research and that many of them fund it from their own pockets. We can say that from our experience, because for years we have experienced this situation ourselves. And we do not forget also that a unfavourable socio-economic situation in most countries and the exchange rates can make unaffordable a system of fixed fees of payment per article. Analyzed the pros and cons of an author payment financing model, and considering the funding needs of the journal, we believe that the most fair model is an intermediate author payment system based on free donation. Instead of setting a fixed price per item we will accept donations by authors. From a practical standpoint, submitting articles for review to the journal will remain free, but if the article is accepted we will request a financial donation from the authors, consistent with the economic possibilities of researchers. Therefore donations are accepted from 1.00 € (valid for all articles submitted subsequent to April 30th.). Finally, responding in advance to possible criticism, we want to make it clear that the scientific and editorial team of the journal will continue working on the same line as it always has, with rigour and effort, irrespective of grants for researchers who wish to publish in Intangible Capital.